The U.S. Green Building Council has developed the well-known LEED® rating system to recognize and certify buildings that are “green” or sustainable. The current iteration of this popular system is LEED version 4 (LEED v4), which applies to a range of building types. In addition to the general New Construction standard, there are also specific standards for Core and Shell building development, Schools, Retail, Data Centers, Warehouses and Distribution Centers, Hospitality, and Healthcare. All of these categories are widespread building types, but they are also all excellent candidates for construction using metal buildings. How can metal buildings be used to help contribute to earning LEED credits and ultimately certification at the certified, silver, gold, or platinum levels? There are actually multiple ways based on the LEED v4 categories and criteria. Because they’re shop-fabricated, metal building systems allow field assembly using a minimal work area, which can also mean less disruption of natural areas and less potential for erosion. Once the building is in place, metal roofing, having a high solar reflectance and SRI, can be installed. Having a roof with a high solar reflectance index applied on the appropriate roof slope assists with achieving points for heat island reduction according to the criteria and calculations in LEED v4. Metal buildings can be designed and constructed to create an energy-efficient building enclosure to satisfy both the prerequisite and credit portions of the LEED Energy and Atmosphere category. The Metal Building Manufacturers Association (MBMA) publishes an Energy Design Guide for Metal Building Systems, available at www.mbmamanual.com, which can help in this process. Using resources like this, designers and installers can produce a building that has effective insulation, reduced air leakage, high-performance windows and doors, and coordinates with the foundation construction to achieve very favorable energy performance. Further, a metal building with a properly sloped roof can also be the ideal base to support solar panels that can provide an onsite source of renewable energy for the building to capitalize on. All of these factors can be used to earn LEED points across several several sections of this EA category. A prerequisite for any LEED building is to reduce the amount of construction and demolition waste by recycling, recovering, or reusing building materials. Since metal buildings are shop-fabricated to suit a particular project, there is very little waste to begin with. Any excess or scrap metals, particularly steel and aluminum, are readily and easily recyclable. Looking to the bigger picture, LEED v4 recognizes efforts to address the impacts of materials over their full life cycle, including materials used in metal buildings. The MBMA has taken the lead on preparing an industry-wide Life Cycle Assessment (LCA) protocol that can be used to support achieving points for this MR credit. The LCA includes primary structural steel frames and secondary structural steel (purlins and girts), along with roof and wall products used in metal buildings. MBMA has also prepared Environmental Product Declarations (EPDs) based on the LCA and industry-wide product category rules. By using this information, the environmental impacts of metal buildings can be determined from the extraction of raw materials through manufacturing and shipping (“cradle to gate”). The fact that steel products of all types contain a significant percentage of recycled material, and can be again recycled at the end of the service life of the building, contributes in producing favorable LCA results. LEED has always recognized that the interior spaces of buildings can have a significant impact on protecting the health and well-being of the people inside the building. Metal buildings can help in this EQ category in several ways. Most notably, metal building components are shop painted, which means that volatile organic compounds (VOCs) in the paint are controlled at the factory, not released at the jobsite. Further, daylighting and exterior views can be easily incorporated into a metal building design to achieve LEED credits, since steel construction offers a great deal of structural design flexibility. Ultimately, it is the combination and interaction of all the LEED categories that shape the sustainable performance of a building. Metal buildings clearly have multiple ways in which they contribute toward obtaining certification under LEED v4.0. To find out more about green and sustainable characteristics of metal building systems and products, contact your local Ceco representative. It is well known that pre-engineered metal buildings are suitable for a wide range of uses and can be customized to suit many different situations. Part of that customization comes from the size and type of doors that can be designed and built into them. All metal building manufacturers can accommodate rough openings for just about any common-sized door, but a few can even provide the doors and hardware too as part of a total, single-source package. This is particularly true for roll-up doors that are suitable for vehicle entries, loading docks, or self-storage facilities. Let’s take a closer look. Roll-up doors provide large unencumbered openings in commercial buildings to allow vehicles of all types to pass through. Cars, trucks, boats, recreational vehicles, and plenty more can all be accommodated by selecting a properly sized door that rolls up quickly and out of the way without any concern about interference or blockage, as is sometimes encountered with overhead doors that open to a horizontal position. In loading-dock situations, the doors can separate the dock area from trucks but allow forklifts, handcarts, or other freight-moving equipment to pass through easily and efficiently. In the closed position, they can provide a weathertight seal against the outdoors, including ratings for wind resistance. In order to allow for easy and fast opening and closing, electric operators and sensors are common that can automatically open or close the doors as forklifts or other vehicles approach or move away from the door. In other cases, they can simply be operated on demand with wall-mounted switches or, for smaller-sized doors, can be manually operated with a chain pull. The rise in the demand for self-storage buildings and facilities has resulted in the use of many roll-up doors being incorporated to access each of the individual storage spaces. Since these doors provide a fully accessible opening, they maximize the types and sizes of items that can be stored without sacrificing needed storage space. They can also provide a secure and safe door opening in an economical and durable manner. Further, the door finish can be specified to provide a durable and long-lasting door surface with a full range of available color and finish types. Regardless of the building use, when looking to provide a design with multiple, large-opening roll-up doors, recognize that the total building enclosure can be provided by the same manufacturer. This means that an insulated metal building with all of the structure and other elements detailed and specified can come from a single source. It also means that compatibility and coordination of doors and other building components is likely already worked out and optimized for efficiency, performance, and economy. Further, all of the accessories and any options can come with the full package as well. Overall, metal roll-up doors are well suited to be paired with pre-engineered metal buildings. For designers, they streamline the design process and allow for proven systems to work together. For builders, they reduce installation and construction issues in the field while maximizing competitiveness and profit potential. For the owners, they can provide a single-source responsibility to create a building that will be durable, usable, and attractive for many years to come. To learn more about pre-engineered metal building packages that can include roll-up doors, visit http://www.cecobuildings.com. It is well known that pre-engineered metal buildings are suitable for a wide range of uses and can be customized to suit many different situations. Part of that customization comes from the size and type of doors that can be designed and built into them…. In our prior post we looked at the advantages that pre-engineered metal buildings have compared to wood-framed buildings. Since building owners, architects, developers, engineers, and others routinely seek the best value for the investment made in design and construction, it benefits us to look at a similar comparison between metal buildings and common building construction that uses concrete and masonry. Speed of Construction: Concrete work requires a number of time-consuming steps, including creating and placing formwork, mixing and pouring concrete, waiting for the curing process to take place, and form removal. Masonry similarly requires mixing of mortar and grout, the placement of the masonry units, and then the curing of the mortar. Metal buildings do not require the time for any of those steps, except for concrete foundations, where used. Instead, the metal components can be installed quickly, efficiently, and with no waiting. Less Building Weight: Concrete and masonry are inherently heavy materials and that extra weight, or dead load, needs to be taken into account in the structural engineering of the building. 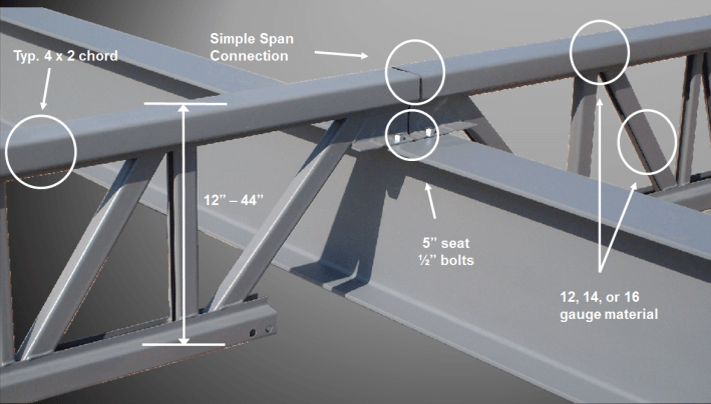 That usually translates into larger structural members such as beams, columns, and footings. When the building is constructed instead out of steel, those elements can all be less heavy, comparatively smaller, and usually less expensive. Site Crews: Pre-engineered metal buildings use the controlled factory conditions to perform critical fabrication functions. That means the onsite crew doesn’t need to have special skills, such as having a certified welder, to construct and assemble the building. That saves time and money compared to construction crews for conventional structural steel, concrete, and masonry work. Recycling: It is common for a significant portion of the steel used in pre-engineered metal buildings to come from recycled materials, helping to conserve natural resources. At the end of the service life of the building, those materials can again be recycled and used for a new building or new purposes. Concrete and masonry do not typically contain recycled content and at more difficult to recycle at the end of their service life. Resilience: Concrete and masonry structures need to be designed with extra measures in order to survive extreme conditions such as an earthquake. Steel buildings can readily be design to address the dynamic loading conditions imposed by seismic activity and have proven themselves repeatedly in this regard. Weather Tolerance: Concrete and masonry construction is usually very dependent on favorable weather conditions. That doesn’t just mean a lack of wind or rain; it means appropriate temperatures of between about 40 and 80 degrees Fahrenheit. Poor weather conditions not only impact the quality of the workmanship, they can compromise the strength and the quality of concrete, mortar, grout, and similar products. Steel construction overcomes those limitations since the structure is sized and prepared in the factory without needing to rely on field conditions to be constructed accurately. Further, metal building components can tolerate temperatures that are both hotter and colder than those tolerated by masonry and concrete construction. That means the metal building construction can continue without being limited by most weather conditions, helping to keep projects on their time schedules. With the number of ways that pre-engineered metal buildings provide advantages over concrete and masonry construction, it is easy to see why they remain such a popular choice for low-rise buildings of many different types. Learn more at http://www.mbma.com or http://www.cecobuildings.com. The Metal Building Manufacturers Association (MBMA) tells us that over the past 80 years more than 14 million metal building systems have been constructed in a wide range of building types and sizes. They have grown in popularity to the point that MBMA estimates that 48% of the low-rise buildings built in the United States utilize metal building systems. Why do pre-engineered metal buildings enjoy such popularity? It becomes readily apparent when compared to the alternative forms of construction available. In this post, we will identify some of the advantages that metal buildings have over conventional wood-framed construction, which is sometimes seen as a common, inexpensive way to construct not only residential buildings, but light commercial buildings as well. In a future post, we will make a similar comparison between metal buildings and construction using concrete and masonry. Design Flexibility: Wood structural members have some notable limitations on their capabilities, such as clear spans of floors and roofs. That means that structural wood walls or columns and beams need to be located close together, which may or may not be conducive to a particular building design scheme. The steel in metal buildings allows for longer spans and greater design flexibility. The stronger material also means that the depth of the steel members does not need to be as deep as wood members, saving on the space required and helping to economize the overall construction. Energy Efficiency: The insulating properties of insulated metal panels (IMPs) offer significant R-values, which can readily meet or exceed current energy codes and contribute toward credits in the Leadership in Energy and Environmental Design (LEED) Green Building Rating System. Because of the higher R-value insulation used in IMPs, less space is needed for the insulation compared to typical wood wall assemblies. Fire-Resistant Construction: Metal building construction provides a non-flammable and non-combustible material for construction. As such it can qualify for different construction types under the building code than wood does. That can help in other ways, such as allowable floor areas and sprinkler requirements. Low Maintenance: Steel building materials are inherently stronger and more durable than wood, meaning they typically require less maintenance, helping owners save money over the life of the building. Pre-finished Materials: Most of the visible components of a metal building can be provided pre-finished in the factory. That includes exposed structural members, panels, and even fasteners such as screws and nails. Pre-finishing assures consistent and uniform appearance but also saves construction time compared to field-finishing wood products and systems. Weather Tolerance: Wood construction can be very dependent on favorable weather conditions. Sudden rainstorms or melting snow can penetrate wood products and cause swelling or other damage that can compromise the structural performance or appearance of wood. Steel construction is not prone to the same type of damage from the weather as wood is. That means the integrity of the metal building systems can remain intact without the need to worry about removing and redoing wood construction work. With the number of ways that pre-engineered metal buildings provide advantages over wood construction, it is easy to see why they remain such a popular choice for low-rise buildings of many different types. Learn more at http://www.mbma.com or http://www.cecobuildings.com.